This championship shall only be known as and referred to as the “Nulon Nationals”. 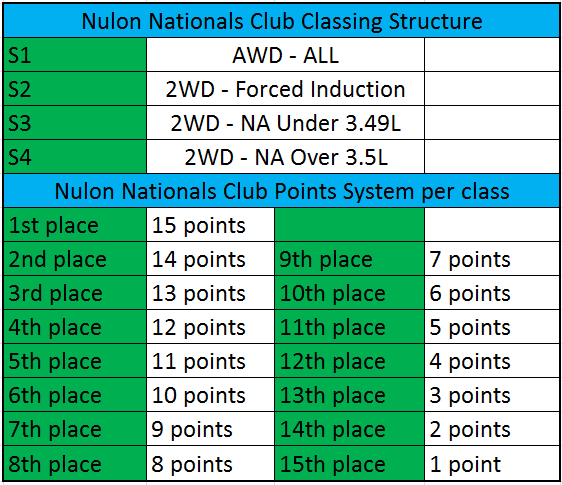 Each event in the Nulon Nationals 2016 (Nationals) shall be conducted under the provisions of the International Sporting Code of the Federation Internationale de l’Automobile (FIA); the National Competition Rules (NCR), the Speed Event Standing Regulations (Hillclimb and Circuit) and the National Motorkhana Code (NMC) of the Confederation of Australian Motor Sport Ltd (CAMS); the Sporting and Technical Regulations issued for this Nationals; Supplementary and Further Regulations issued by the organiser at each round; Bulletins issued by the Stewards of the Meeting and any Driver Briefing Notes or instructions issued by the Race Director or Clerk of the Course at a meeting. The classification of the event as determined under the NCR will determine which regulations particular competitions to be conducted under. To be eligible to compete in the Nationals, each Competitor must hold a minimum of a Level 2S CAMS Competitor’s Licence and be a financial member of a car club affiliated with CAMS. There will be no fee for this series registration. The Nationals shall operation under the Nulon Nationals registration and Entry Process. Registration and Entry Forms shall be available from the Nulon Nationals website and with document checking being conducted at each round of the Nationals. The Event Organisers reserve the right to stop the event at any time they consider necessary in the interest of safety, or for any other reason. Nulon Nationals reserve the right to cancel, abandon or postpone the event in accordance with NCR 59 of the current CAMS Manual of Motor Sport. The Supplementary Regulations for a nominated event must include the following statement and the entry form must have provision for the competitor to nominate for the series. Each event must be conducted under a multi-club or state status CAMS permit. Must be fitted with at least a three point seat belt (Type C), complying with CAMS Manual Schedule I, if it is a road registered closed vehicle. All other vehicles must be fitted with a Type B seat belt. May have roll over protection fitted. If rollover protection is fitted it must conform to the Schedule J requirements pertaining to each specific event. There may be specific tyre requirements at some competition venues, and the Supplementary Regulations of the event will specify any such requirements and will take precedence over these series regulations. Note: The Organisers may re-classify any vehicle if they believe it is not eligible for the class in which it has been entered. Prizes, trophies and awards shall be as determined by Nulon and shall be advised to each Competitor before the event, Trophies for each class will be awarded. The club who has accumulated the most points will be declared the winner. In the event of a tie on points between clubs we will assess the best finish in each discipline, a count back will occur to determine which club achieved the highest class placings. If there is still a tie, the competitors will be declared joint-winners. All Prize money will be split in the event of a tie. We follow the Cams Anti – Doping policy which stats that: Any holder of a CAMS ‘Competition’ or ‘Officials’ licence (or equivalent licence issued by another ASN) may be tested for the presence of drugs (or other banned substances) and subject to a penalty(ies) for a breach in accordance with the CAMS Anti-Doping Policy and/or the CAMS Illicit Drugs in Sport (Safety Testing) Policy as published on the CAMS website. Consumption of alcohol in the paddock, pits or any section of the competition venue/course under the control of the Officials is forbidden until all competition is concluded each day. Accordingly, any holder of a CAMS ‘Competition’ or ‘Officials’ licence (or equivalent licence issued by another ASN) may also be tested for the presence of alcohol by a CAMS Accredited Testing Official (CATO) in accordance with the CAMS Standard Operating Procedure for Breath Alcohol Testing.